My, he is a squirmy one! Amie has now joined the local PCA church in which we worship. Yesterday morning we had him baptized. Our friend Danny, who is the Associate Pastor, handled the explanation and vows. I handled the squirming son, and the actual baptism. It took quite some time as Danny kept losing his place due to the side show going on around him. CavSon kept wanting to play with the ear piece from the wireless system I had on since I was preaching. May blessings break upon his head. He did much better when I actually poured water on his head. He seemed to like that. Of course, he had been working up a sweat. Afterward he wanted to play with the rest of the water, which was not a surprise to either of us. It was great for CavDaughter to watch this. She was up there with us initially, but she was quite antsy too, so we had her sit with friends. She’s on the video. We talked with her a little bit about it the previous day or two. She knows she has been baptized, and we should show her that video. She’s fascinated by pictures of herself when she was a baby. We received word while we were in Jacksonville that his new birth certificates had arrived at the lawyer’s office. I picked them up this morning. Now we can work toward his U.S. citizenship. But he is now part of the visible church, which is great news in my book. May his adoption into our family eventually result in his being adopted into God’s family. I watched a fair amount of the Presidential Nominees’ Forum hosted by Saddleback Church. I both liked it, and didn’t like it. What I liked was that both candidates answered the same questions, and didn’t interact with each other’s answers. They were able to stay on task and not get caught up in attacking one another. I also liked that the audience was well prepped. They applauded both nominees, and did not boo them. They were respectful. Their reactions will be reserved for the voting booth, which is great. What I didn’t like is the notion that they were somehow trying to win the “evangelical vote”. I don’t care if either of them can share the right terminology to explain their understanding of Jesus. I’m not looking for them to be my pastor, but to be our President. That has a very different set of criteria. Both candidates playfully pandered to Rick Warren. I have no problem with that- it helped set people at ease and it was for show. They knew they weren’t pulling something over on people, nor were they trying to. For me, the big differences between two candidates was the Obama certainly came across as more personable. But McCain’s answers (whether or not you agree with him) were more clear and decisive. Obama sounded thoughtful, but that doesn’t help me know how he’s going to lead us as a nation. For a candidate proposing change, the notion that Edward Kennedy will be one of his most trusted advisors is shocking. He is the ultimate insider, and stands behind some of the most messed up moments in American politics in recent memory. Not a good move by Barak. Nor was hemming & hawing about abortion. Women don’t get abortions because they have inadequate healthcare or don’t know they can easily and quickly find someone to adopt the child. I thought McCain had a better grasp of economics. I also thought Obama doesn’t get that people don’t mind taxes for roads and schools (unless they fail). It’s all the entitlements and earmarks that people are frustrated with and don’t want to see their taxes raised to continue. Obama also didn’t seem balanced his view of America, or other nations. Yes, we are FAR from perfect. We are not the only nation to deal with racism- it is a problem in every nation in which people of different ethnicities live. But I’d take our track record with the poor and disadvantaged than any other nations’. Are we jailing and murdering political dissidents? No. Religious people? No. This is, by and large, a generous nation. Think of all the humanitarian aid we provide each year- even to nations that don’t like us. Think of the numerous people, mostly Christians, who’ve given their time and money to rebuild New Orleans and other areas devastated by Katrina. Just one of my pet peeves- only mentioning the bad we do, and never acknowledging or downplaying the good we’ve done. Yes, we have some really dark marks on our record, but also some good ones. I thought the forum was helpful, mostly. Any thoughts? There has been plenty going on to occupy the CavFamily. For one thing, we have put our home on the market. We did this to preserve our equity since the prices are only going down, and we probably won’t get this much for at least a few years. We hope to be moving elsewhere soon. If I receive a new call, we’ll have a headstart on selling the house. This means lots of work. We have been “de-cluttering”, which mostly means packing up unnecessary items to create the perception of more space in the home. The real estate agent is hopeful; our home is priced competetively and the market for smaller homes is better than for larger homes. I got plenty of work done Friday and Saturday- to which CavGirl commented “You’re a workhorse, daddy.” She picked this phrase up from Jon & Kate Plus 8. The excess stuff is gone and the home is ready for the virtual tour photos. With a vacation coming up, we also had to “de-dog” the home. He is a shedding machine. As a result, the prospect of asking our neighbors to not only let him out, but being able to vacuum the home on a moment’s notice if an agent wants to show it and how he might respond to strangers means he needs to go on vacation. Just not with us. Former neighbors agreed to watch him while we are away. But, they now live a few hours away. So, on a trip to visit family they stopped by last night to pick him up. CavGirl was not quite down with that. Tired and hungry, she had a mini-meltdown because the dog is gone, temporarily. It was a good thing the dog is gone. Shortly after putting the kids to bed, CavWife realized it was getting warm in the house. The A/C was not working, period. Not even the fan or heat. I think the lightening storm must of wiped out the thermostat and a nearby fan used to create white noise for sleeping children. It was a long, warm, sticky night in the house. We had some doors and windows open. No telling how the dog would react to the various noises and critters outside. I didn’t get much sleep, crashing in the living room since it had better airflow. Thankfully, the forecast says that it is only supposed to get to around 88 today. Much better than 95+. But I passed on the shower in the hopes that the A/C guy has it up and running around lunch time. Then I take CavBoy to his re-evaluation for his hearing. They wanted to see how the better tubes affected his hearing. Saturday was a long, tiring day. We had the joy of going to another wedding. We sat with a friend and her 3 year-old. CavGirl, CavBoy and their friend had too much fun. We should have gotten a babysitter since I got so stressed out at the noise and endless questions. I found them a huge distraction but the people around us didn’t seem too put off. At the reception, I was able to spend time with a guy I rented a room from while getting my 2nd degree from RTS. He also rented a room to the groom. Like CavSon, he was born with a cleft-plate, so we spent time comparing notes as it were. We left the reception around 2, after CavBoy’s diaper seems to have sprung a leak. Too much to drink for that boy. So we had to slip out the back quietly. He crashed on the short ride home, but CavGirl was another story. Her whining was a preview for the evening. All my parenting tricks failed. Nothing seemed to get through to her and grew increasingly exasperated. It was a good prelude to my sermon on Sunday on how God loves us enough to discipline us. This morning, our speech therapist called to say he wasn’t coming. We requested a new speech therapist, but wanted the transition to take place when we went on vacation. He decided “what’s the point”- ah, our son’s well-being… We don’t want him to go 5 weeks without speech therapy. This therapist seems to have little experience with cleft-palate kids (though he talked like an expert). His recommendations were about 180 degrees different from everyone else’s. He also refused to take his personal history as a recently adopted kid into account and determined his progress in 4 sessions was insignificant. I’m not sure why he was informed of this change now, but I’m not liking how he bailed on CavSon today. 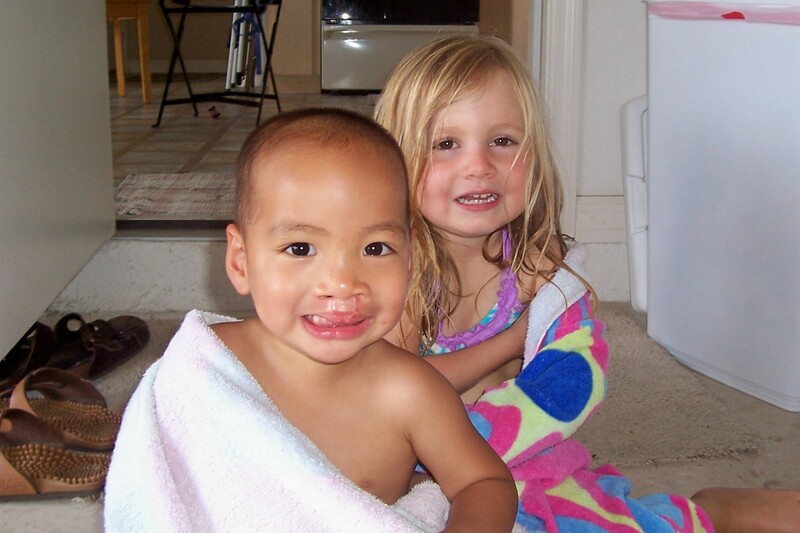 So now we are looking for a new therapist with experience working cleft-palate kids locally. As if we didn’t have enough happening. So, I have now escaped to my ‘office’ for cooler air and a quiet atmosphere. Much needed for my sanity. My stay here will be much too short. Update: The A/C repair cost about $160. It didn’t look good at first, but it turned out that the transformer and relay had been blown out by a power surge. Had it taken a direct hit by lightening, the whole shebang would have to be repaired costing about $1,600. So we are thankful! CavSon’s hearing exam came back as borderline normal, which is great news. He’s had a rough day since he didn’t sleep well. He was crying most of the way home, even when I held his hand he was not comforted. Not the best thing for my shoulder. While CavWife helped a friend pack for a cross-town move into their new home, I took the kids to the playground. I hadn’t been there with them since March or April. I was joyfully amazed at the progress CavGirl has made. He was climbing the various ladders, without help, and going down the slides alone. She even had me teach her how to climb the “rock” wall. She did pretty well for a first timer. CavSon did okay. He’s still not excited about slides or swings. They’ll grow on him. They both enjoyed the deck that goes over the lake. We saw plenty of fishes among the junk that had been tossed in. You can’t swim at the beach anymore. It is covered over with weeds on land and in the water. Probably too hard to keep the gators away. The beach was probably victim of a previous budget crunch. The victims of the next budget crunch were sitting there the entire time we were there. There were 3 emplyees from Leisure Services sitting, talking and reading. Their job would be to play with neighborhood kids. But there were no kids there. Which is unfortunate- it was an overcast day so it wasn’t mind-numbingly hot, and we saw a bunch of kids down the street. CavGirl has experienced a number of falls off her bike lately. Tumbles in general. She’s got a cut on her big toe that keeps opening up. She did a good job banging up a finger. She rides too fast and tries to turn. We are still working on actually stopping to look both ways before entering the road. She is currently engrossed in Jon & Kate Plus 8 while CavWife taught aerobics. She loves watching all the kids. She just calls it watching the kids. We now have a video tape dedicated to the show. His speech therapy is going okay. He’s trying. He can make the ‘p’ sound, but has not yet integrated it into actual words. But the therapist isn’t happy. He disagrees with the surgeon regarding the need to repair the fistula. We have decided: 1. he has little experience with cleft palate kids, 2. he is not taking CavSon’s speech in context (here 6 months, this is his 2nd language, undergoing major surgery…). So, when we return from vacation, we should have a new speech therapist to work with him.